To lose all thought of self in Thine eternity. 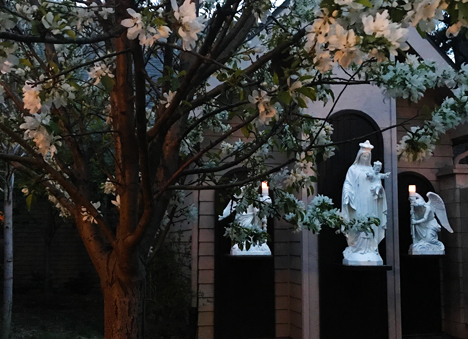 Given up to joy in the Resurrection, the Church sings her happiness and proclaims the glory of the Lord… She never tires of celebrating Christ’s resurrection and the redemptive graces which have transformed our lives. But man forgets his better self with disconcerting ease… [T]he Easter celebrations on earth are only a foretaste of the eternal Easter; perfect joy awaits us in heaven, the crown of a faithfully-lived Christian life… [As]a traveler making for his heavenly home, the Christian knows he must pursue his path on earth and continue to observe all the obligations of human existence; this is pleasing to God. The trials themselves have their part to play: they form our initiation into eternal life. Fully directed towards the final triumph, the Christian’s life is a struggle in which the victory already won in the person of our Savior must be progressively consolidated in each one of us. “Fidelity to the present moment is our key to becoming a Saint, fulfilling in this way our daily duty, and making use of the obscure graces that God sends to us every day, even in the most fleeting moments and smallest duties and trials. 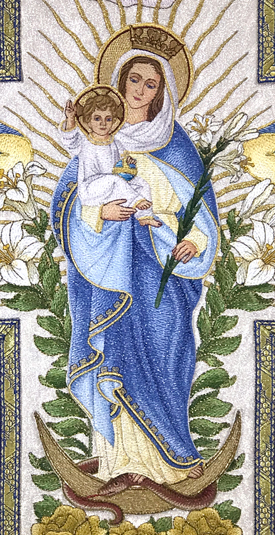 Our recent newsletters have highlighted all of this in relation to Our Lady of Fatima, and indeed, it was Our Lady who said to little Jacinta, “If men knew what eternity is, they would do everything to change their lives.” We can see, then, how this subject of time and eternity is closely related to that daily fidelity to the present moment. Our labors in time should be with the purpose of earning and preparing for a happy eternity. So it is love, selfless love of God and neighbor, which is the essential element that must fill our time on earth. What we are doing merely becomes an expression of that love, whether it is some task He has assigned to us, however small, or some suffering He has sent our way or perhaps that we have brought upon ourselves, or even some enjoyment that we take part in for love of God. Perhaps we are not all called to be Apostles, great orators or miracle workers, but we are all called to be lovers and Saints, sometimes in the smallest and most hidden details of ordinary life. As we go to our daily work, our “daily duty,” let each of us keep this thought in the forefront of our minds, so that we may make the very best use of the time God has allotted to each one. Oh glorious history! grand book written by the Holy Spirit in this present time! It is still in the press to turn out holy souls. There is never a day when the type is not arranged, when the ink is not applied, when the pages are not printed. The present moment is ever filled with infinite treasures; it contains more than you have capacity to hold. Faith is the measure. Believe, and it will be done to you accordingly. Love is also the measure. The more the heart loves, the more it desires; and the more it desires, so much the more will it receive. The will of God presents itself to us at each moment as an immense ocean that no human heart can fathom; but what the heart can receive from this ocean is equal to the measure of our faith, confidence, and love. The whole creation cannot fill the human heart, for the heart’s capacity surpasses all that is not God. …The divine will is an abyss of which the present moment is the entrance. Plunge into this abyss and you will always find it infinitely more vast than your desires. Do not flatter anyone, nor worship your own illusions; they can neither give you anything nor take anything from you. You will receive your fullness from the will of God alone, which will not leave you empty. Adore it, put it first, before all other things…. 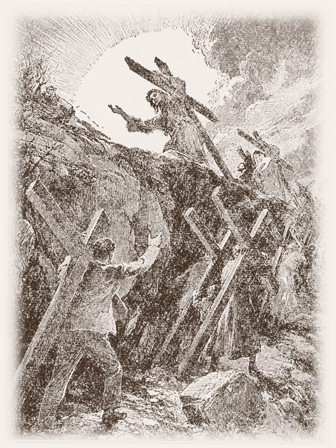 Our “featured sacramental” this newsletter is the Crucifix. But having spoken about the crucifix in the past, we want to share a rather remarkable story about the French wood crucifixes we sell and the loving providence of God, through the intercession of St Joseph, which brought together people from three nations in order to make these exquisite and devotional sacramentals available once more. Having served our country in the military, he is now working as an engineer. His degree is in Metallurgical Engineering. Our subsequent conversations with him revealed that he was familiar with the methods used by the Bancels in France. Some time passed after those initial discussions, but Scott had not been idle! Wheels are always turning in the minds of the bold-and-creative! Not long after we sent out that October newsletter, Scott Bingham, the brother-in-law of one of our Sisters, wrote us about a dream he had been harboring over some years about starting his own business making some type of crucifix. He had neither seen nor read our newsletter! But coincidentally enough, he decided to ask us about the idea right at that time. Something providential about that, don’t you think? Having served our country in the military, he is now working as an engineer. His degree is in Metallurgical Engineering. Our subsequent conversations with him revealed that he was familiar with the methods used by the Bancels in France. Some time passed after those initial discussions, but Scott had not been idle! Wheels are always turning in the minds of the bold-and-creative! Just after Christmas, our discussions began again, with the Sisters sharing all we knew about the crucifixes and the high demand there is for them. As things progressed, soon we were discussing the possibility of Scott actually going to France to visit the Bancels and learn all he could of their successful and time-honored art. With the help of our good friend, Andrew, who has aided us immeasurably over the years with our website and has been our interpreter with the Bancels for many years, a contact between Scott and the Bancels was arranged. In order to facilitate communication during his time in France, Scott then went into ‘turbo speed’ to learn French. Every waking moment, he was hearing it, studying it, speaking it. We had a most enjoyable recreation, hearing the recounting of the conversation between Scott’s daughter, age 8 and the eldest of his five children, with her Carmelite Auntie after a family visit: “Dad is always listening to French in the car, and I’m learning too…” Then Sister was treated to her niece’s newly acquired French vocabulary. 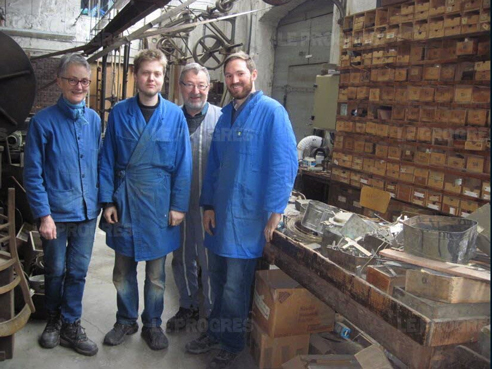 Things rarely work out so smoothly, but much to our delight, in early April, he was on his way to France, where he spent time with the Bancels being carefully instructed in all the fine details of making the beautiful crucifixes. 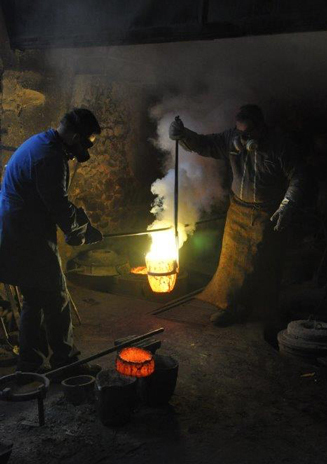 And to add even more interest and delight to this adventure, the nephew of our English Sister, a young man from Wales who has long been interested in blacksmithing, joined Scott in France at the Bancels! 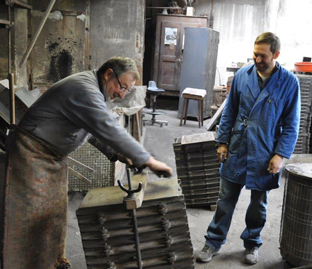 Mrs. Bancel emailed us nearly every day with pictures and updates of the three artisans at work: a Frenchman, an American, and a Welshman, all focused intently on their work, as the two young men learned the tricks of the trade from the master. They had a marvelous time under the generous hospitality of the Bancels, which included meeting other artisans from the region, and sharing croissants, Brie and wine, amid the rather long and intense work days. We asked Scott on his return how his previous experience and learning had helped, and he told us that while he was familiar with about 60-70% of the work involved in the complex and skilled manufacturing process, there were many skills, techniques and tips he learned under Mr. Bancel’s superb tutelage that he said would have taken several years to master on his own through trial and error. They learned so very much while there! 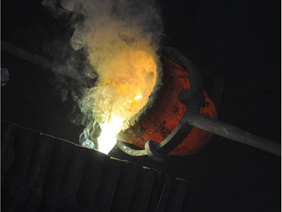 Now, hardly a month after the trip, Scott has been working hard, and Vexilla Regis Foundry Works, LLC is an established company. The name is from the opening words of the beautiful, ancient hymn for Passiontide in the Divine Office – “The standard of the King”, Our Crucified Savior. 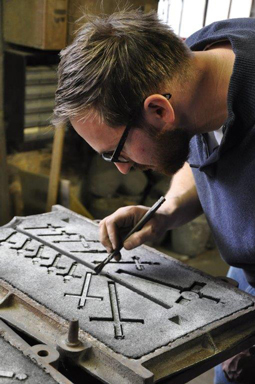 Scott brought back several crucifixes that he made while in France, which we are happy now to offer on our website, and he is gathering the necessary machinery, equipment and tools he needs to continue making them. In short, he is building a small foundry for this intricate work. While his business will at least initially, be quite a bit smaller than the Bancels’, which at its peak employed 80 people, he will be offering the St. Benedict wood inlaid crucifix (which so many of our customers have missed and continue to request) and hopes to be able to offer the Profession crucifix and other style crucifixes, God willing, in the future. Mr. Bingham’s attention to detail, quality of workmanship and devotion to the work shows in his pieces, just as it did with the Bancels. He, a devout Catholic with a growing family, is happy and proud to keep this art alive in the Church. We keep thinking that maybe his three young sons (ages 3-7) will one day join him to form “Bingham and Sons”! He tells us that already they are fascinated with his “tinkering” that has fast become “production”! We are happy and proud to be able to keep offering such an excellent quality sacramental for the devotion of the Faithful. And we believe that the Bancels are very proud indeed to see their life’s work so appreciated and continued on, God willing, in future generations – even though it be far from their homeland. 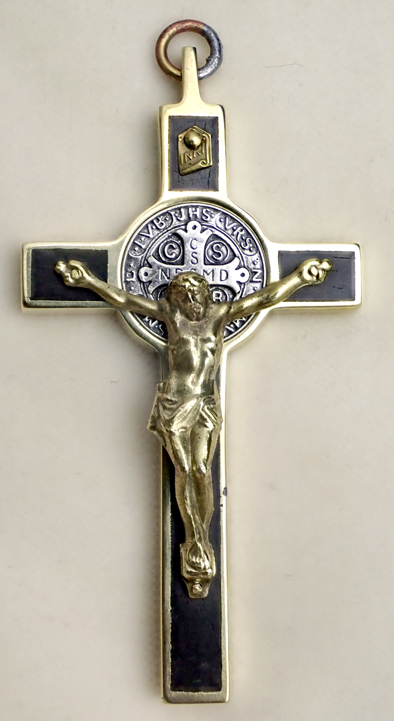 So – to make the formal, joyful announcement: Once again, we will have, at first in limited supply, the ebony/nickel St. Benedict crucifixes, as well a new two-tone brass/nickel combination of Scott’s own design. If you would like to receive an email notification when these, and other styles of crucifixes, are available, you can sign up here. And, in your kindness, please assist with your good prayers this worthy endeavor. We see its attempt and success as more than just one man’s enterprise, but a true share in the patrimony of the Church – her sacramentals and her devotional art. Although we had never intended to have more than a small selection of books for children on our website, we have found the demand for these books is constantly growing among visitors to our site. Young Catholic families have a hard time finding truly good books – books that do not trivialize the Faith, as is so often the case with children’s books about religion, but that present it forthrightly, reverently, intelligently. So we have gradually been expanding our Children’s books section, and now offer a beautifully illustrated Children’s Bible. As well, some of the old Catholic children’s series are now being reprinted, and we are pleased to have these in our selection. 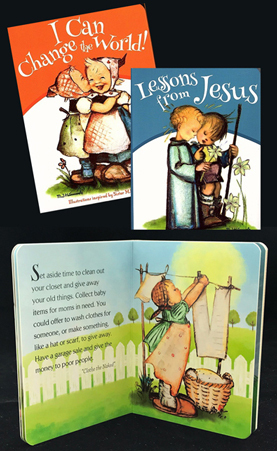 The solid cardboard-page books for very small children have found popularity again, and those composed and illustrated by Sister Maria Innocentia Hummell are sweet favorites. Simple for children to understand, these books are an excellent introduction into the basic truths and practices of our Faith and of prayer. 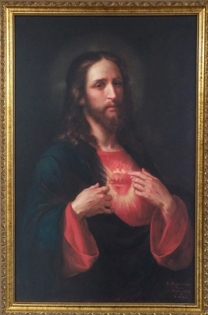 With the month of June around the corner, we are happy to announce that we will once again be able to offer framed prints of the Sacred Heart by Jose Maria Ibarraran y Ponce. The Catholic gentleman who owned the original of this remarkable painting died in late 2016, which is why prints became unavailable for a time. Fortunately, his family desires to continue the beautiful work of making prints available, and so we will have them soon – again in two sizes, as well as unframed. It is under this same directive that we take up a deeper silence and more fervent prayer. With the Blessed Virgin Mary, the Apostles, and the disciples, among whom were the holy women who so stalwartly supported, learned from, mourned and believed the Savior, we take our place. With them and in their spirit, we implore the Father to send the Holy Spirit upon His Church. These are indeed special days of earnest prayer and recollection. 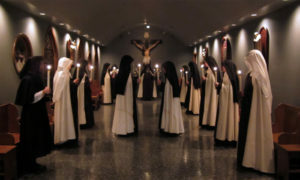 On the Feast of Pentecost, it is a Carmelite custom for each of the nuns to draws from written cards a Gift and a Fruit of the Holy Spirit. Inspired by the verse from the Book of Wisdom (1:7), “The Spirit of the Lord fills the world, is all embracing….,” we have added to the custom that each Sister also draws some region of the globe for her particular attention – to pray and to sacrifice for those nations and their peoples. So it is a very spiritually full and beautiful time for Carmel, these last days of Paschaltide, when the plenitude of gifts from Heaven, through the holy Liturgy, bless and guide us. Of course, one of the big projects keeping us so busy the past year was in the sewing room. In fact, it was THE project of the last year and a half. The last time we mentioned one of our sewing projects, one of our long time friends who receives our newsletter expressed his surprise and disappointment to see us with sewing machine and embroidery software. We’re sure that he’s not the only one to have imagined us bending over our sewing with needle and thread! Indeed, we ourselves had to adjust to this whole “Technology thing,” as we have often mentioned over the years in previous newsletters. 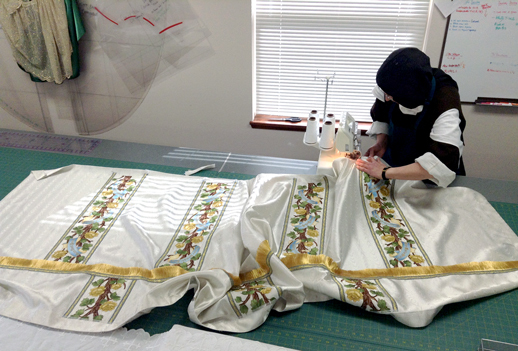 In “the old days,” embroidery for a single vestment might have taken several years for a single nun to complete. 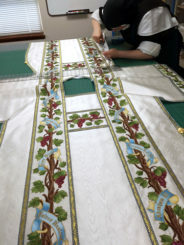 We would never be able to assist with our own Priests’ needs in the way of altar linens and vestments if we depended solely on hand work (although we still do that, too!). 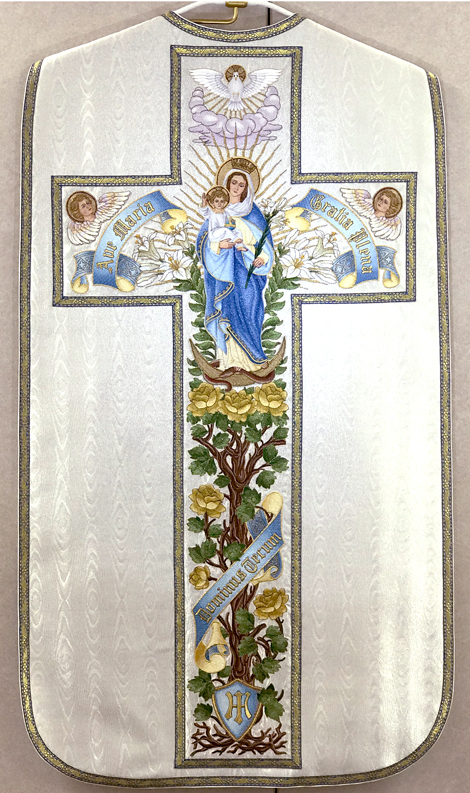 With the desire to be generous, to give all we can to provide for the Divine Worship, the embroidery machine and its software provide a wonderful instrument to accomplish that “giving all.” How else could we have reproduced not only a precious legacy from Pope Pius XII, but the Requiem vestment we showed you a few years ago with the lovely weeping willow design? And so many others that inspire new ideas to express the Catholic Faith? So we see it all as trying to revive a lost art by applying new tools to produce “old” art for the “ancient Faith”! We could add to this that it is a privilege to put to such holy and exalted use the “digital age”! Few people know or remember that it was very often the monks and nuns of monasteries that introduced electricity, running water and other modern conveniences into villages, towns and homes. To “revive a lost art” was certainly the case with our last project. 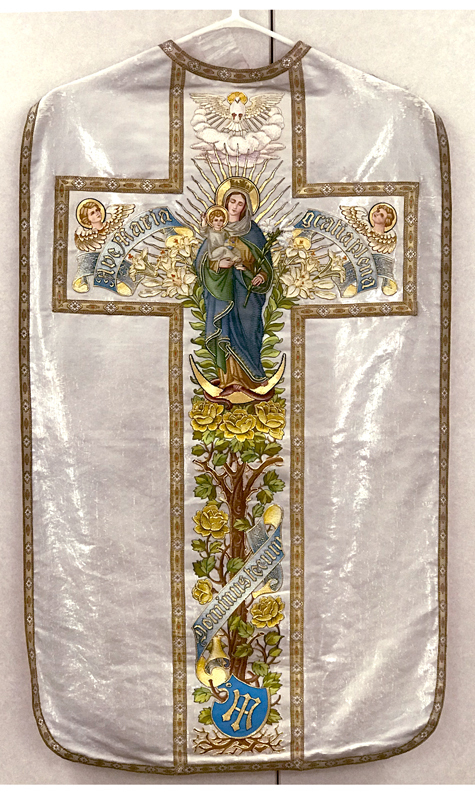 One of our priests was given a gift, by the original Brooklyn Carmelite Monastery, on the occasion of his ordination 45 years ago, a vestment from Pope Pius XII, with silver fabric and beautiful embroidery. 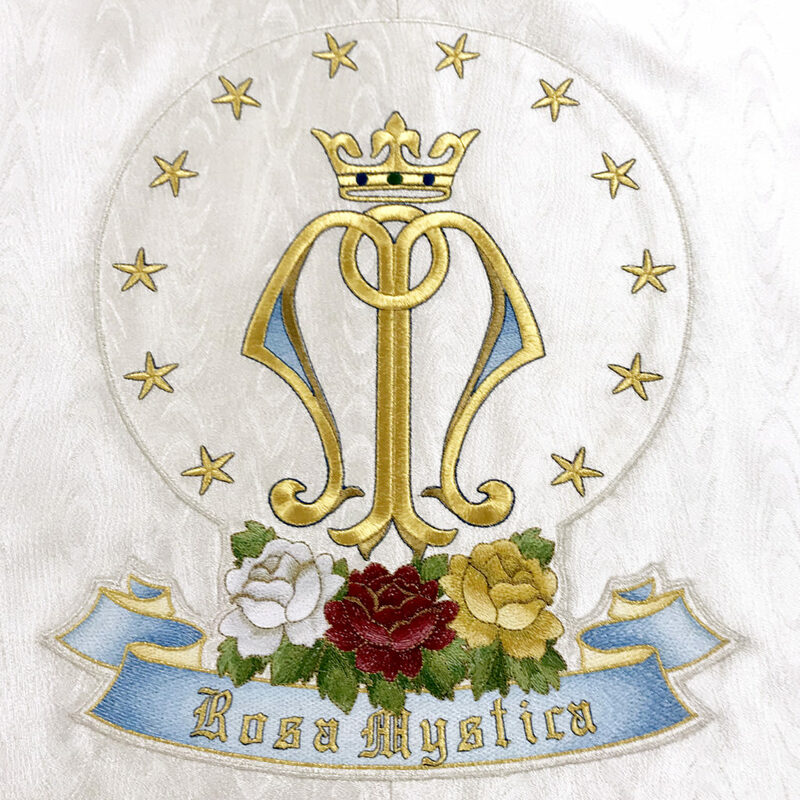 The vestment, always reserved for the Feast of the Immaculate Conception each year, eventually has become so worn that it is no longer able to be used for Mass. So the idea was hatched – – – to re-create this extraordinary vestment and give it as a gift for Father’s 45th priestly anniversary. And not only to re-create it, but to design a whole solemn set – including dalmatic, tunic, antependium, humeral veil, etc. – along with it. 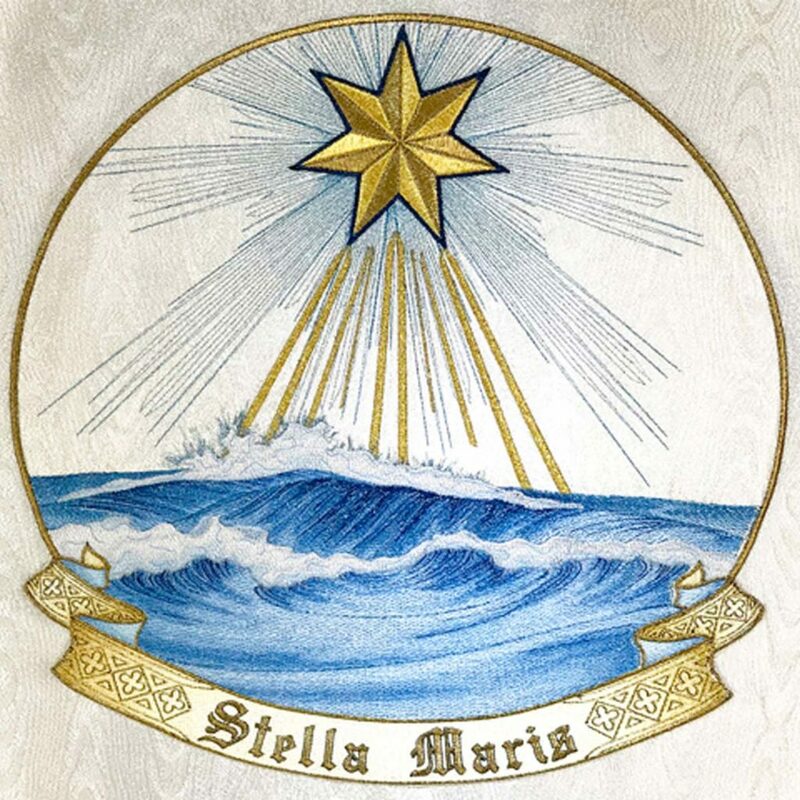 The ocean in the “Ave Maris Stella” applique featured on the antependium proved to be the ultimate challenge. How do you make stitches look like moving water?! Our “ocean spray” took on many different forms before we finally found something that looked realistic, thanks to the artful eye and helpful critique and ideas from all of the Sisters. Here again, color choice was of the utmost importance. The silver fabric also proved a challenge for our veteran sewing Sisters. This is actually cloth of sterling silver, mind you. Heavy and beautiful, but fragile in some ways, the pieces we cut seemed to start fraying if we merely moved them across the cutting table, so we left plenty of allowance in the seams! And while we digitized the embroidery to fit exactly (down to the 1/16 of an inch) into the patterns and places allotted for it, computer files and 3-D stitching are two different things. Stitches move, pull in, and stretch out fabric, and things can be a bit unpredictable. Sometimes patterns pulled in and were 2 inches shorter than they were supposed to be, and a couple of times we planned for it to pull in 2 inches and it didn’t pull in at all. (Oh, dear!) In response to those results, the Sisters simply and steadily, with trials of the that wonderful virtue of patience, readjusted patterns, sometimes needing to resort to ironing and stretching the fabric to make everything fit and look like it belonged. And, of course, it all did “belong” in the end. As is the case with all the sewing we do, it was a labor of love: for God, for His Blessed Mother and for the Holy Sacrifice of the Mass, for the holy Priesthood. 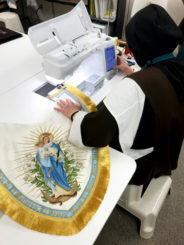 We might add that it is not to “show off” the work or talents of the Sisters that we “show and tell” about the vestments, but to share our joy in being able to produce something beautiful for Divine Worship. Too, it is a reminder to the world of what the great and good God is worthy. It has always been the tradition of true Christians to give to God the very best of the fruit of their mind, creativity and labors – “Worthy is the Lord!” In these days of speed and efficiency, the tendency has often become to be also slipshod and utterly tasteless in what passes for “art”. Sadly, this is also often seen in current ecclesiastical and liturgical art. Beauty seems to be forgotten and abandoned for what is bland, or trendy or worldly/utilitarian. Thanks be to God, there is evidence that the trends are turning! Traditional liturgical fabrics, trims and other accoutrements are once again becoming more available. And most happily of all, it is among the young that this is all becoming more and more appreciated. The little mudroom we built off our kitchen outside door is now completed, with a layer of paint and a few stone steps out front until we are able to complete the landscaping in that area. 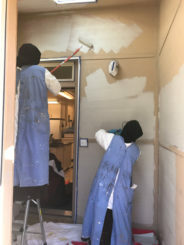 The dogs enjoyed watching the Sisters paint and arrange the interior – which includes hooks and shelves for their leashes and other puppy paraphernalia. This is only the beginning of “building” projects we have been considering and planning, but we still wait upon the Providence of God to see if those plans should become a reality. If all goes well, we will be updating you about those in future newsletters. In the meantime, there is always still plenty to do to keep us busy! Here’s a short list: *With technology moving forward at light-speed, we must give attention to updates on the website. *The re-launching of our rosary repair apostolate required a few tweaks to set that in motion. *We have been making many rosaries and scapulars for all the First Communions and Confirmations this time of year. *Add to this running the kitchen which feeds all of these Carmelites three times a day, and the sewing room, which keeps them all clothed (habit repairs and a few new habits are in the works) and spending needed time to clean up our awakening gardens and take care of the grounds that God has given us…. Oh, how filled our short hours for work each day are! It always seems that there are never enough minutes in a day to complete all that needs to be accomplished, and we know that this plague is not limited to our enclosure. We know from family and friends like you that you share the problem. But somehow, by God’s dear guidance, things do get done, don’t they? So the old myth that the contemplative life is rather leisurely can safely be put in the dustbin! We share in the primal command of God that His creature, man, must “till and keep.” It is all part and parcel of everyone’s life here on earth. The Carmelite Rule very pointedly lays down the injunction: “You shall do some kind of work, that the devil may always find you occupied,” and “He who shall not work, neither let him eat.” No – rest is for Heaven, for eternity. Time is for work, for labor, for merit, and so we go out to “find our Lord amongst the pots and pans” (St. Teresa). And so do we come full circle back to our discussion of Time. Thus do we come to the end of our letter this time. 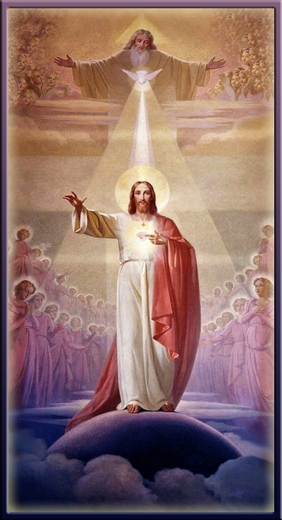 Please be assured of our prayers for you – that the presence of the Holy Spirit, the Paraclete, may guide the paths of your every day and hour – and lead you safely to Eternity! Every moment comes to us pregnant with a command from God, only to pass on and plunge into eternity, there to remain forever what we have made it… The enemy is glad to make you lose time, even if he cannot make you lose eternity.